Thank you for your interest in setting up an account with Accredited Drug Testing, Inc. (ADT). Employers who have at least 5 employees and intend to conduct future testing are eligible to establish an employer account for drug and alcohol testing services. Benefits of having an account include monthly invoicing, 5% discount on standard testing fees, compliance consultation and personalized service. Individuals are not eligible to establish an account and must pay for services when scheduled. Please find listed below information regarding our testing services, fees and other Drug Free Work Place Program information. About Us – Accredited Drug Testing, Inc. provides DOT and Non-DOT drug and alcohol testing, drug free work place policies, random testing programs, occupational health physicals and consultation to small, medium and large companies wishing to maintain a drug free work place. Our company is recognized as one of the nation’s leading providers of these services and all our staff hold various industry certifications. 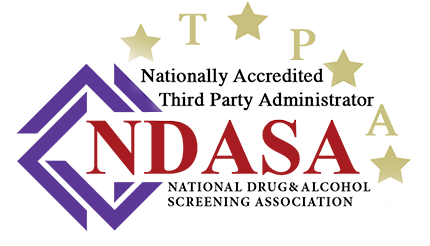 Our company is also a member of the National Drug and Alcohol Testing Industry Association (DATIA), the Substance Abuse Program Administrators Association (SAPAA) and the U.S Chamber of Commerce. Testing Methods – Accredited Drug Testing, Inc. provides urine, hair, oral saliva and blood testing. All drug tests can be analyzed in 5, 9, 10, 12, and 14 panel screenings (drugs). In addition to standard testing, drug tests can also be screened for prescription drugs and synthetic marijuana. Alcohol testing is also available through urine, hair and a breath alcohol test (BAT). Testing Center Locations – Accredited Drug Testing, Inc. has testing centers and affiliated collection sites in all cities Nationwide and our testing centers are in most cases within minutes of an employer’s business address or an employee’s home address. If your company has multiple locations in other cities or States, ADT can schedule and manage the testing program for all locations. Employer Account Set Up – Establishing an account with Accredited Drug Testing is fast and easy. There is no initial set up fees or contracts required. Simply complete a new account profile form and agree to our invoice policies and you can begin testing. Important Information - Clients who have established an account set-up by completing the required account set-up information will be invoiced on the first of each month for all testing services provided the previous 30 days. A valid credit card must be maintained on file and will only be charged for invoices which are past due. Accredited Drug Testing members will automatically receive a 5% discount on all tests and services.